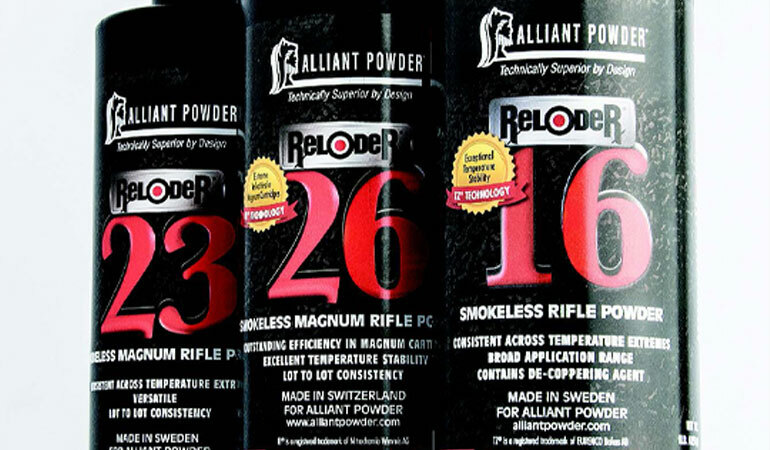 Alliant Powder’s all-new line of temperature-stable powders is a top choice for long-range shooters, for whom a few differences in feet per second could mean a miss. Before the long-range renaissance struck, gunpowder consistency across temperature extremes wasn’t a big deal. As long as a given propellant provided good velocity and was easy to tune for accuracy, hand-loaders loved it. Several of my favorite powders fall into this category: Reloder 15, Reloder 19 and Reloder 22, just to name a few. Manufactured in Sweden, all produce above-par speed and tend to provide outstanding accuracy across a broad range of rifles. However, they have one Achilles’ heel. When the temperature plummets or climbs dramatically, velocity tends to drop or climb with it, and occasionally a pressure spike can occur when the weather is super hot. More than once I’ve worked up a beautifully accurate load in wintertime conditions, just to have the same ammo blow primers when fired on a sultry July day. Funnily enough, pressure spikes aren’t what deters long-range shooters. Nope, it’s the fact that at long range just 40 fps difference can cause a low or high miss. Whether shooting at steel plates during a precision rifle match or at a big western mule deer across a canyon, that’s a bad deal. Certain propellants have become known for temperature stability, meaning their velocity varies little whether it’s scorching or freezing. Hodgdon’s Extreme line started the temp stable trend and to this day remains the benchmark to which all others are compared. Unfortunately, this line of powders is manufactured in Australia, and just a few years ago the facility that produces it experienced a catastrophic fire. It took months to rebuild and begin manufacturing again, and supply has been slow to catch up to demand. To help fill the void, Hodgdon-owned, Canada-based IMR designed and introduced its excellent Enduron line of powders, which not only is quite temperature stable but also has a copper fouling reducing agent. I’ve written about it in this column, and it’s good stuff. Until recently, Alliant’s Reloder line has not provided competitive temperature stability characteristics. That’s changed with three recently introduced Reloder powders: 16, 23 and 26. They are advertised as stable across a vast spread of temperatures. And like IMR’s Enduron line, they feature a de-coppering additive that helps prevent heavy metal buildup. Significantly, Alliant promises outstanding lot-to-lot consistency. Marketing-speak is one thing. Real-world extreme-temperature testing tells the true story. To test performance, I loaded two of the three new propellants in a couple of my favorite cartridges. Specifically, RL-16 and RL-26. Intentionally, I chose one cutting-edge cartridge, the 6.5 Creedmoor, and one with classic, traditional design, the .300 H&H. For the 6.5 I picked Barnes’ outstanding 127-grain LRX, a sleek, tough pill with match-bullet accuracy. For the .300 I chose Hornady’s super-aerodynamic 212-grain ELD-X. 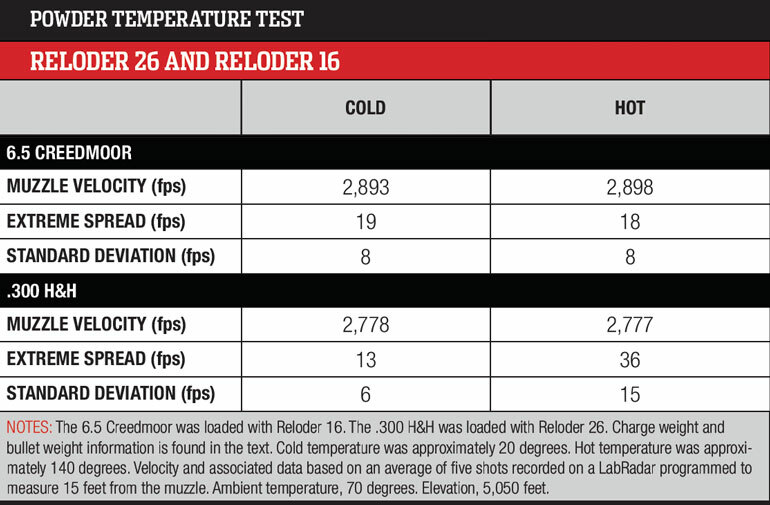 Charge weights were 43.0 grains of Reloder 16 for the 6.5 and 67.0 grains of Reloder 26 for the H&H. My deep freeze chills only to 20 degrees, which would have to do. The night before heading to the range, I put half of my test ammo in the freezer. Early the next morning I filled a cooler with hot water—at a temperature of 140 degrees to be precise—wrapped the remaining half in Ziploc bags and submerged them in the hot water. I tested the frozen ammo first, snatching each round out of the ice separately, dunking it into the magazine, closing the bolt, and triggering the rifle briskly to prevent the chamber from warming the cartridge before it fired. I did remove one frozen cartridge from the warm chamber after 30 seconds, and it was still significantly cold to the touch. I’m confident that between the barrier-like brass walls of the cartridge case and the naturally insulating and entirely chilled fluffy propellant charge inside, I got them fired while still frozen. When extremely cold, most ammunition becomes less consistent, meaning extreme spread and standard deviation open up a bit. Sometimes a lot. That wasn’t the case with my RL-16 and RL-26 handloads. Instead, standard deviation was tight: eight fps for the 6.5 Creedmoor/RL-16 load and six fps for the .300 H&H/RL-26 load. While the chambers were still warm, I forged on and tested the hot ammunition. Incredibly, the jump of 120 degrees from one test batch to the other made little difference. The 6.5 Creedmoor load averaged just five fps faster, and extreme spread and standard deviation were almost identical. To my surprise, the 140-degree .300 H&H ammo actually averaged one fps less in muzzle velocity. Consistency suffered a bit, at 36 fps extreme spread and 15 fps standard deviation. However, I have an explanation for that. My double-layer Ziploc bags had sprung a leak, and the ammunition became a trifle damp. I suspect a bit of moisture had found its way inside a couple of the cartridges and created a variable that wasn’t present in the other test batches. While my two tests compose a statistically small sample, I believe the results were significant. Needless to say, I’m now entirely confident that Alliant’s temp stable lineup provides top-shelf consistency and stability across extremes in temperature. Combined with Reloder powders’ propensity for top velocities and easy tunability for a desired level of accuracy, that makes it appealing indeed for long-range precision shooters.